Flux is a pad and tampon delivery service based in the UK. We’re here to make sure you’ve always got the things you need for your period, so you’ll never have to be unprepared again! If you can't find the information you need below, then shoot us an email on [email protected] and we'll do our very best to help you out. At the moment we offer two types of pads (Bodyform and Always Ultra) and two types of tampon (Tampax and Lil-Lets), in different absorbencies. First you’ll pick the box that corresponds with the average length of your period, and then you get a choice of extras like pantyliners. The next step is to tell us which brands of pads/tampons and absorbencies you want, pick a delivery date and BAM – you’re ready to go! How do I know which products to pick? It’s better to use as low an absorbency pad or tampon as possible, so our tip is to work out how much of the heavier absorbencies you require first and fill in the rest of your choices with the lighter pads/tampons! We’ve currently got a choice of either 5 or 10 Bodyform SoSlim pantyliners, but we’re working on getting in some more exciting products soon, so just watch this space! How do I know which delivery date to choose? If you know your cycle length you can work out when you want your first box to be delivered by adding the number of days in your cycle on to the day your last period started. This will then give you an idea of which delivery date to choose so that you’re prepared for your next period! Otherwise, it’s good to aim for the next available delivery date (just make sure it’s more than 5 working days away from the day you order, so that we’ve got time to prepare your box), and then change it when you have a better idea of when your period might arrive. 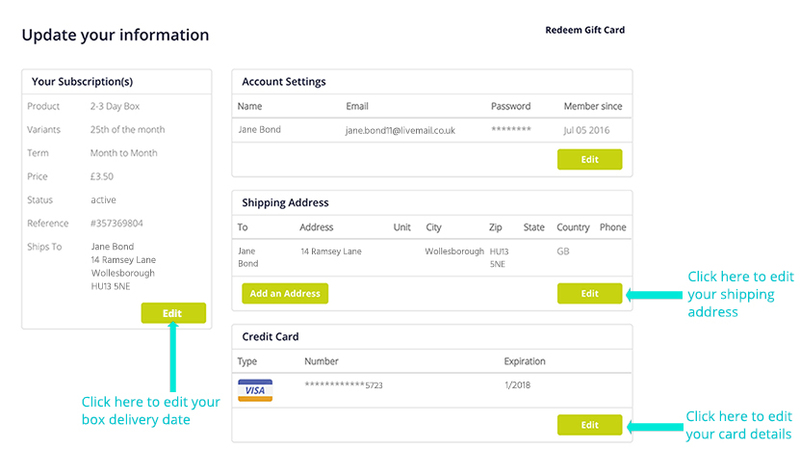 You can change your delivery date easily in your account settings. Do I have to pay extra for post and packaging? Nope! The price you see on the product page is what you pay for the service – no secret extra charges! We’ve tried our best to make sure the boxes are small enough to fit through the majority of UK letterboxes, but there are always going to be one or two odd ones. So, we’ve kept the outside of the box discreet in case you want it delivered to your office or somewhere you can pick it up a bit more easily! Here’s how to change your shipping address. Currently we deliver our boxes to anywhere in the UK, through the Royal Mail. You’ll be billed immediately when you order your first box, and then after that you’ll be billed on the first of every month for the box that you receive that month. All the normal payment methods are accepted – Mastercard, Visa and American Express. From time to time we issue voucher codes for discounts on our service. These are normally for use on your first box only, and for only one per person/household depending on the code. Our team do check the voucher code orders regularly, so make sure you’re playing by the rules! 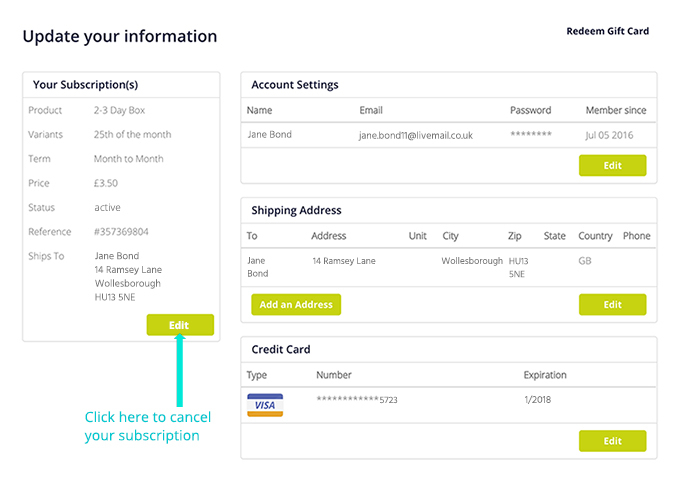 If you need to change your address, email, password, card details or the delivery date of your Flux subscription, you can do them yourself by logging into your account settings. Click the 'Login' button on the top right hand corner of your screen, and put in your email address and password. You'll be redirected to your account page. If you're already logged in, click on your name in the top right hand corner of the screen, and then click 'My Account'. If you're still having trouble, then contact us on [email protected] and we'll be happy to lend a helping hand! If your needs have changed and you’d like a different mix of products, send us an email on [email protected] and we’ll sort it out for you. There was a problem with my order! We try our best to make sure everything’s ship-shape, but if you're having any issue at all then let us know on [email protected] as soon as possible and we’ll do our best to fix it for you! 2. 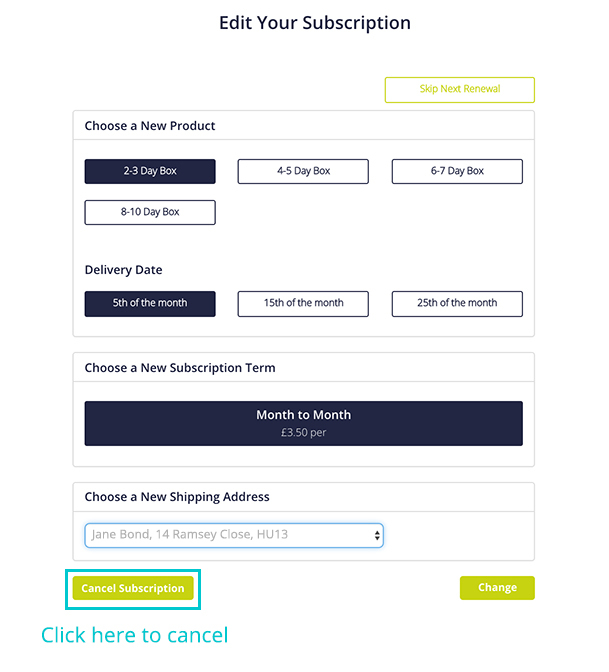 Then clicking on 'Cancel Subscription'. And it's easy as that!